Recently, Michael Rood was interviewed in respect of the actions of Obama to abstain from the vote on UN Resolution 2334, adopted on December 23, 2016, mandating a “two state” solution to the question of Israel. In his interview, Michael talked about the historical precedent in scripture for the actions of Obama, which he compared with Antiochus Epiphenes. Antiochus was the notorious character well described in the books of the Makkabiym (Maccabees) which are included in the Eth CEPHER, but are missing from most American Bibles. Part of Michael’s reasoning had to do with the similarities of the dates in which the defilement of Antiochus took place; namely on December 25, which at that time coincided with 25 Kiclev (25 Asar), which is the Hebrew date designated by these Scriptures to be the first day of Chanukkah (the Feast of Dedication). Whether we agree with these dates is not relevant to our discussion here. What is relevant is Michael’s lamenting about the redaction of these books from the American Bible, and his lament is well placed. For those of you who believe that Scripture is complete in a 66-book bible, consider that these books were included in the 1560 Geneva Bible (the Puritan Bible); the 1611 King James Authorized Version (the Anglican Bible), and most have been included in the Canonized Catholic Bible. The history of banning these books begins with the Westminster Confession, which excluded the Apocrypha from the canon, claiming that these books were not of divine inspiration, and that they were nothing more than other human writings. This Confession, however, was a political instrument raised by Puritans who had risen up against King Charles I, the third-generation heir to King James. King James, you may recall, rejected the Calvinist interpretation to “footnote” the 1560 Geneva Bible (which also contained all of the books of the Apocrypha), and elected to go exclusively with the text of Scripture (subject to his parameters). There was no calling the Pope the Antichrist in the 1611 KJV. Yet, with the adoption of the Westminster Confession, Calvinist ideas gained foothold in Scottish Presbyterianism, and the rise of this movement eventually shifted the theology of the Anglican Church. The Puritan Sabbath, called the “Lord's Day” as set forth in the Westminster Confession of Faith, required Puritans to keep Sunday as the Sabbath, and to set aside the entire day. While the Westminster Confession claims to be wholly sola scriptura (after deleting the books the council it didn’t like) and claiming that the Old and New Testament in the original languages possessed infallible truth and divine authority, the church clearly ignored the original language in several key passages. The understanding of the Westminster Confession is belied by the obvious misinterpretation of the word σάββατον Sabbaton (Strong's G4521). Of the 62 times the word Sabbaton appears in the “New Testament,” there are 8 occasions when the Geneva and the KJV interpreters elected to use the phrase “the first day of the week” as the English translation of this term. In all other instances, these same interpreters used the word Sabbath in respect of the word Sabbaton. Let’s take a look (notice that Wycliffe, in his earlier interpretation, was divergent in several places). KJV Matthew 28:1 In the end of the sabbath, as it began to dawn toward the first day of the week (Sabbaton), came Mary Magdalene and the other Mary to see the sepulchre. AND long after the Shabbath, as it grew light following the Shabbath, came Miryam of Migdal and the other Miryam and beheld the sepulchre. And very early in the morning of the Shabbath, they came to the sepulchre at the rising of the sun. KJV Mark16:9 Now when Jesus was risen early the first day of the week (Sabbaton), he appeared first to Mary Magdalene, out of whom he had cast seven devils. Now when YAHUSHA was risen, early Shabbath morning, he appeared first to Miryam of Migdal, out of whom he had cast seven devils. KJV Luke 24:1 Now upon the first day of the week (Sabbaton), very early in the morning, they came unto the sepulchre, bringing the spices which they had prepared, and certain others with them. (One day of the week – Wycliffe). NOW on that certain Shabbath, very early in the morning, they came to the sepulchre, bringing the spices which they had prepared, and certain others with them. KJV John 20:1 The first day of the week (Sabbaton) cometh Mary Magdalene early, when it was yet dark, unto the sepulchre, and seeth the stone taken away from the sepulchre. (One day of the week – Wycliffe). NOW on that certain Shabbath came Miryam of Migdal early, when it was yet dark, to the sepulchre, and saw the stone taken away from the sepulchre. KJV Joh 20:19 Then the same day at evening, being the first day of the week (Sabbaton), when the doors were shut where the disciples were assembled for fear of the Jews, came Jesus and stood in the midst, and saith unto them, Peace be unto you. (One of the Sabbaths – Wycliffe). Accordingly, it being at even, the first of the Shabbath, when the doors were shut, where the Talmidiym were assembled for fear of the Yahudiym, came YAHUSHA, and stood in the midst, and said to them, Peace be with you. KJV Acts 20:7 And upon the first day of the week (Sabbaton), when the disciples came together to break bread, Paul preached unto them, ready to depart on the morrow; and continued his speech until midnight. And upon the first Shabbath, when the Talmidiym came together to break bread, Sha’ul preached to them, ready to depart on the morrow; and continued his speech until midnight. It is interesting when it is interpreted consistently with the underlying Greek, and the verse makes it clear that the Talmidiym (disciples) came together to break bread on the first Shabbath (of the month). This may be a pattern that some of you might consider in your own practice, as it appears to be referring to breaking bread and taking the cup in remembrance. KJV 1Co 16:2 Upon the first day of the week (Sabbaton) let every one of you lay by him in store, as God hath prospered him, that there be no gatherings when I come. (Nothing in the Wycliffe). Upon the Shabbath let everyone of you lay by him in store, as YAHUAH has prospered him, that there be no gatherings when I come. Isaiah 34:8 - For it is the day of the LORD'S vengeance, and the year of recompences for the controversy of Zion. Jeremiah 46:10 - For this is the day of the Lord GOD of hosts, a day of vengeance, that he may avenge him of his adversaries: and the sword shall devour, and it shall be satiate and made drunk with their blood: for the Lord GOD of hosts hath a sacrifice in the north country by the river Euphrates. Lamentations 2:22 - Thou hast called as in a solemn day my terrors round about, so that in the day of the LORD'S anger none escaped nor remained: those that I have swaddled and brought up hath mine enemy consumed. Ezekiel 13:5 - Ye have not gone up into the gaps, neither made up the hedge for the house of Israel to stand in the battle in the day of the LORD. Joel 2:11 - And the LORD shall utter his voice before his army: for his camp is very great: for he is strong that executeth his word: for the day of the LORD is great and very terrible; and who can abide it? Joel 3:14 - Multitudes, multitudes in the valley of decision: for the day of the LORD is near in the valley of decision. Amos 5:20 - Shall not the day of the LORD be darkness, and not light? even very dark, and no brightness in it? Zephaniah 1:7 - Hold thy peace at the presence of the Lord GOD: for the day of the LORD is at hand: for the LORD hath prepared a sacrifice, he hath bid his guests. Zephaniah 1:8 - And it shall come to pass in the day of the LORD'S sacrifice, that I will punish the princes, and the king's children, and all such as are clothed with strange apparel. Zephaniah 1:14 - The great day of the LORD is near, it is near, and hasteth greatly, even the voice of the day of the LORD: the mighty man shall cry there bitterly. Zephaniah 1:18 - Neither their silver nor their gold shall be able to deliver them in the day of the LORD'S wrath; but the whole land shall be devoured by the fire of his jealousy: for he shall make even a speedy riddance of all them that dwell in the land. Zephaniah 2:2 - Before the decree bring forth, before the day pass as the chaff, before the fierce anger of the LORD come upon you, before the day of the LORD'S anger come upon you. Zephaniah 2:3 - Seek ye the LORD, all ye meek of the earth, which have wrought his judgment; seek righteousness, seek meekness: it may be ye shall be hid in the day of the LORD'S anger. Zechariah 14:1 - Behold, the day of the LORD cometh, and thy spoil shall be divided in the midst of thee. By looking at this comprehensive list, we see that the “LORD’S day” brings with it destruction, cruelty, wrath and fierce anger, vengeance, sacrifice, consuming of enemies, battle, day of the heathen, great terribleness, sun into darkness, moon into blood, decision, darkness, punishment, bitterness, a speedy riddance, judgment, anger, division, Eliyahu, deliverance to Satan, coming as a thief in the night. Is this practice consistent with Scripture? 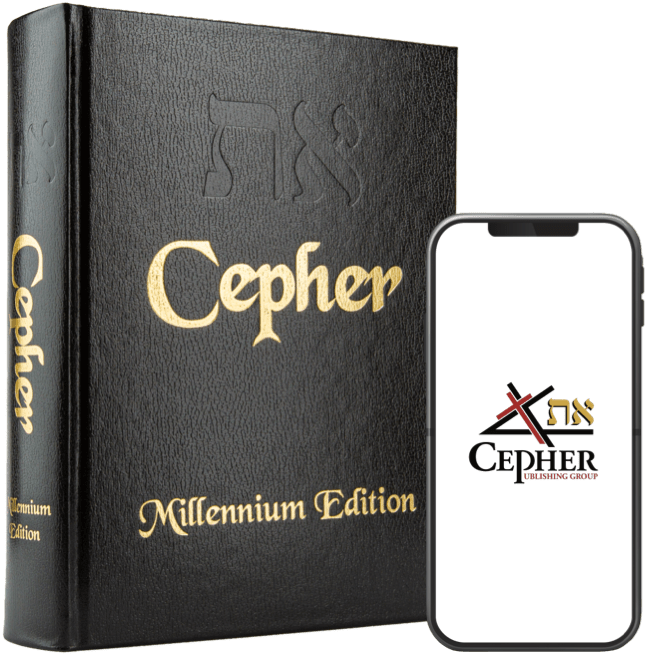 The Eth CEPHER includes not only 1 & 2 Makkabiym (Maccabees), but also 3 & 4 Makkabiym, which gives both an entire historical picture of the period, and also lays out further understanding of the essence of spirituality found in Scripture. Only in reading all four of these books can you discover the true evil that was the position of Antiochus Epiphenes. Equally important, only in these Scriptures can you find the foundation and the true story of Chanukkah. You might ask yourself: Why should I care about Chanukkah? This question is often found among scholars of Scripture today. It is curious that Chanukkah does not appear as a feast in the Tanakh, yet it is practiced by the Jews. It does appear in the Besorah (Gospel) of Yahuchanon (John) 10:22 And it was at Yerushalayim on the feast of Chanukkah, and it was winter. Yet the Mashiachiym ignore it, partly because their Bibles cut out the books of the Makkabiym! Now there are those who have published rhetoric to the effect that the Apocrypha was excluded by these councils, commissions, and societies, because none of the Apocryphal books were written originally in Hebrew. I went ahead and put into bold those Apocryphal works that were initially set forth in Hebrew and translated into the Septuagint around the second or third century BC! So, the people who make this claim based on the failure to be written in Hebrew are simply wrong. In addition, well before Eusebius put his pen to the works, the Ethiopians had already constructed a Bible – or a least a collection of Sacred Scripture from some 200 years before, which included 92 books. Some people, however, are gifted to such a degree that they can eliminate books from the public reach based upon their reasoned opinion – or worse, the collective opinions of a group that constitutes a learned council.